If you have put any research into your family vacation, then you will have surely come across the Teddy bear museum Pattaya. 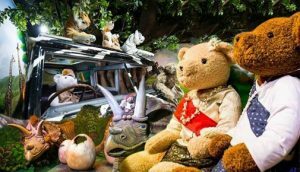 Opened in October 2015 the Teddy bear museum caused quite a stir, nobody was quite sure what it really was or why it’s owners had chosen Pattaya as it’s location? Well since then it has gone from strength to strength, and is now not just a favorite attraction for families but grown up children as well. Located towards the northern end of beach road near Soi 1, it is perfectly located for ease of access, and is right on the main beach and second road baht bus routes. The northern end of beach road and across into Naklua is where you will find most of Pattaya’s family orientated resorts. The museum is open daily from 09:00 – 22:00, tickets can be bought direct at the venue, or from any reputable agency or your hotels ticket desk. The entrance cost is 500thb. Once inside you are able to wander and explore at your own pace and the tour can last as long as you choice. The museum is very relaxed on dress code, so popping in after a morning on the beach is a great way to escape the high afternoon heat. Inside the museum is split into 12 zones each depicting a different theme or genre to set the scene, the various themes include Africa, Europe, space and Prehistoric. Within each zone of the museum there are opportunities for you and your family to take photo’s of and with the various teddy bears. Unlike any other museum you may have visited, here you actively invited to touch and feel any of the 2000 teddy bears on show. Even a hug or two is not out of the question. The is also a great shop attached to the museum where you can purchase reasonably priced replicas of the bears, and sizes in the gift shop range from the small key chain size, right up to the large human sized bears. Just bear in mind if your are a family, it can start to add up in cost, entrance fees, refreshments (can’t take your own in), then a teddy for each child, you could be looking at spending 4,000thb and upwards. Our final verdict of the Teddy bear museum Pattaya is that is a great attraction not only for families but, but grown ups as well, conveniently located and easy to reach. Price is reasonably especially if you haggle with your agent. Well worth a visit and highly recommended by us.